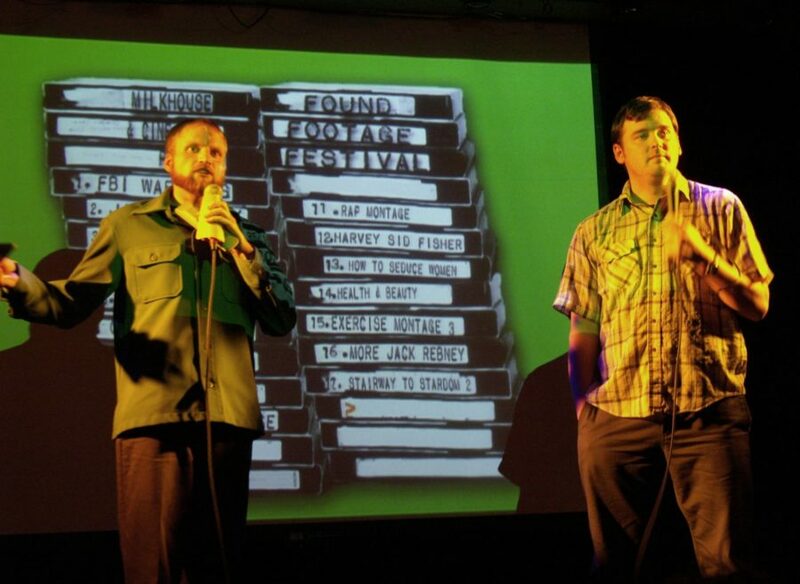 The hosts, Nick Prueher and Joe Pickett, open the Found Footage Festival, where they share VHS videos they find and collect. For most, VHS tapes are dusty memories in a forgotten box, technologically obsolete. But for Joe Pickett and Nick Prueher, creators of the Found Footage Festival, the tapes are a comedic gold mine. The 10-year anniversary tour will be at The Art Theatre Co-op in downtown Champaign on Wednesday at 7:30 p.m. Tickets are $12, and it is the second time this tour will be visiting the area since 2012. Austin McCann, general manager of The Art Theatre Co-op, said he has fond memories of the last show. The next 90 minutes of the show were absolutely hilarious, he said. The show is “a guided tour through our VHS collection,” Prueher said. Videos with similar themes are grouped together and the two comedians provide context and wisecracks in between. “We like to describe the show as ‘Inside the Actor’s Studio’ but for stupid videos that nobody really cares about,” Pickett wrote in an email. Part of the humor comes from the unintentional hilarity of the videos, because they are all failing in some way, according to Prueher. Rather than snarkily ridiculing the content, the men “treat the videos with more respect than they maybe even deserve,” Prueher said, professing a genuine love and reverence for the footage. Nostalgia also factors into the appeal of the show. “VHS is the format we grew up with, so we have some affinity for it,” Prueher said. He described it as the Wild West of video; after the success of Jane Fonda’s workout series, everyone rushed to profit from the new media with weird results. “It’s a kind of recent past that I remember somewhat,” McCann said in agreement. According to him, there is also a slightly disturbing undertone to the videos. The videos are all “a cultural product that has decayed,” he said. The effect of the tapes is hard to replicate now, Prueher said. “Everybody’s sort of more self-aware,” he said. McCann said he blames the recent technological growth, causing people to be constantly surrounded by viral material. He said the show finds a way of sorting through and focusing on highlights. “It’s a funny way of responding to cultural overproduction,” he said. While the videos all have a surreal element, they are all very real. “There’s so much real stuff out there in the world, that there’s no need to play anything fake,” Pickett wrote. Pickett and Prueher curate the show themselves, searching through thrift stores and The Salvation Army stores to find their material. According to Prueher, a system has been established where they hunt for tapes in each city they visit and put together next year’s tour from what they’ve found. According to Pickett, they used to get tapes through much more complicated means, such as applying to work at a video store, stealing all the training videos and quitting the next day. However, it’s not always that hard to find VHS tapes. Pickett said he once found a stack of tapes in a dumpster outside of his apartment. The tape that started the collection was “Inside and Outside Custodial Duties,” found by the two in 1991 at a McDonald’s in their home state, Wisconsin. Some of the tapes come from fans of the show as well. Prueher said he would like to encourage anyone who has a thrift-store tip or tape they think would be fitting to let them know or bring it to the show. “We want to add more videos to the collection,” he said. Another aspect of realism is the people in the videos. “We get obsessed with these videos and want to find out more,” Pickett wrote. This then leads them to tracking down the subjects of the tapes, such as the “bumbling” hosts of the “John and Johnny Show,” a home shopping video. Prueher said they found out the hosts had not talked to each other since 1987. “We spent way too much money to reunite them for the first time in 26 years; especially considering that nobody else in the world cares about this reunion except for us,” Pickett wrote. The return of John and Johnny is not the only new feature for the anniversary tour. Prueher said they decided to spice up their morning talk show interviews by booking him as Chef Keith, who made disgusting dishes with holiday leftovers and fed the creation to five talk show hosts. The videos went viral in March.